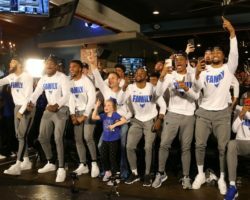 On today’s TB podcast, I’m joined by NY Up’s Matt Parrino to discuss the MAC champion UB Bulls and their journey to a 31-3 record and a 6-seed in the NCAA tourney. Just how did this team in this town get to THIS level of success? We ask former Bulls guard Corey Raley-Ross who played under head coach Reggie Witherspoon for three years and Bobby Hurley/Nate Oats as a senior.